Equal opportunity often overlooks transgender individuals, with the majority facing hurdles in getting—or keeping—a job. 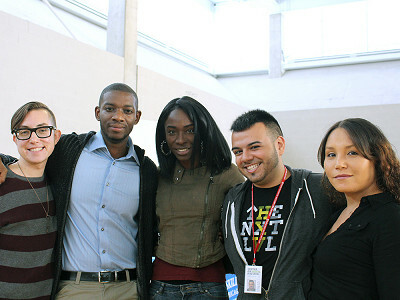 Angelica Ross founded TransTech Social Enterprises after finding it nearly impossible to start her professional career. She taught herself graphic design and multimedia production to get ahead, and now helps others facing similar barriers succeed. TransTech creates educational and job opportunities while helping promote safe, inclusive workplaces where trans professionals can thrive. They teach technical skills and run a creative design firm that offers freelance and full-time work with partner companies. And to help reduce instances of discrimination, they raise awareness and provide cultural competency training. By empowering transgender talent and ensuring that more companies will embrace them, TransTech is helping level the professional playing field. 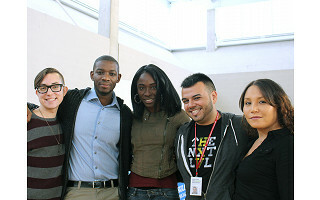 Hi, I'm Angelica Ross, founder of TransTech Social Enterprises. We are a co-working and co-learning tech community focused on education, empowerment, and employment for the most marginalized members of our LGBTQ community. I am excited to share our story here on The Grommet. I wasn't aware of the immense economic exclusion that the transgender community faces and I think it's not common knowledge. Why do you think that is? It has been said that, “privilege is thinking that something is not a problem, because it’s not a problem for you.” What seems to motivate people the most is being able to relate with and see themselves in others struggles and successes, but privilege prevents perspective. Are any companies doing it right? I’m sure there are some companies, doing some things right, but the mistake is to think that we’ve got it. At this time I’m not offering any company a pat on the back for a job well done, because well..the job is not done. We must stay vigilant and constantly hold ourselves accountable on our commitment to true diversity and inclusion. How can companies start making their workplaces more inclusive? One of the first things a company does in it’s formation is consider it’s target market. Being inclusive means not just thinking about your demographic but intentionally including as much diversity in the development and execution of your business as possible. This means including LGBQ, trans and non-binary folks, people of color, women, and all of of the intersections in between in advisory and focus groups, and serving on your boards and committees. Companies should also be looking for innovative and progressive hiring practices. It's fantastic how TransTech is tackling the issue in different ways- bringing access to education and employment as well as educating people -why do you think having the creative design firm is important to TransTech's work? I think I need to take this opportunity to clarify that TransTech does not operate in any traditional or conventional format. We are less of a firm and more of a community of talented and valuable people who have all experienced being looked over or underestimated. It is crucial that we create an environment where our most marginalized members can discover and build their skills to become successful at whatever they put their minds to. How have you seen things change since you began your career? And since you began TransTech 2 years ago? The biggest change I’ve seen is a shift in power for trans people. We have gained more strength and visibility by demanding we been seen, heard, respected, and protected. We’ve demanded that our gay and lesbian allies stop speaking on our behalves. What we need from our allies is their assistance in creating space for us. It’s so important that we speak for ourselves, to our own experiences. Having the space for our worth to be recognized allows us to contribute to society in very crucial ways. What is one thing you'd want people to take away from learning about TransTech? I removed myself from a broken system in order to create a new model. TransTech was created with the community in mind and involved from the very beginning. TransTech is intended to be a member led initiative that recognizes we all have something to teach and something to learn. TransTech is an incubator for the most diverse talent you can imagine, because it is intentional in presenting technology as a solution at the intersections of drive and identity. We are the American Dream in action, that offers a path to success to anyone who is willing to do the work. What do you hope to see happen in both the hiring process and employment in general, in coming years? I’d like to see the day when there isn't one majority in management and executive level positions with the power to make decisions, and that companies continue to increase inclusion, not stopping once a checkbox has been marked off from one diverse hire with multiple identities. Hi Angelica, thanks for what you are doing! I'm a parent of a trans person and am so glad to see that opportunities for our kids are being created from grass roots. I am a member of a large (1,100+) group of moms of LGBT kids, many of whom are transgender. I will share this page with them so that they can learn from you and support you as well! Keep up the good work! Thank you for the kind words, Jennifer, and the work you are doing as well! We appreciate you sharing the story of TransTech and the barriers they're shattering. So you censure comments at Grommet do you? I added two comments and they were not posted. I would like to know why? Can't take the truth? Did I hurt your feeling? Go back to your safe space. You added four comments that weren't posted, Cerebro. Yes, we censored them. They came nowhere near the guidelines we set here on the conversation board. Your comments were not truthful, they were disrespectful. Equal opportunity often overlooks transgender individuals, with the majority facing hurdles in getting—or keeping—a job. Angelica Ross founded TransTech Social Enterprises after finding it nearly impossible to start her professional career. She taught herself graphic design and multimedia production to get ahead, and now helps others facing similar barriers succeed. TransTech creates educational and job opportunities while helping promote safe, inclusive workplaces where trans professionals can thrive. They teach technical skills and run a creative design firm that offers freelance and full-time work with partner companies. And to help reduce instances of discrimination, they raise awareness and provide cultural competency training.